Known by all as Rusty, he passed away on February 14, 2016 after a long illness. Born in New York on December 27, 1932, his parents were Carl Fairly and Marjorie Van Loan. He came to California about 1936 on a boat through the Panama Canal. The boat’s captain called him Rusty due to his bright red hair. His father was a professional baseball player which meant many moves and different schools before the family finally settled in Long Beach. Rusty’s younger brother and best friend, Ron, was a well-known Dodger baseball player. Rusty’s leadership skills began at Jordan High School when he was elected president of the junior class. He lettered in baseball, football, and basketball. After attending Long Beach City College, he transferred to the University of Denver where he earned his bachelor’s and master’s degrees in Administration/Supervision. At Denver, he became the star quarterback and earned the nickname “The Mad Magician” due to his unexpected and spectacular antics on the field. His 1954 football team won both the Skyline Conference title and the Salad Bowl. As MVP, he was inducted into the Hall of Fame in 2004. Rusty married Suzan with whom he had three children, Susan Lyn (Haze), Steven, and David. From Denver, the family moved to Santa Barbara where Rusty taught and coached at UCSB. His true career developed at Santa Barbara City College where he worked for 37 years. Besides coaching and teaching, he was most proud of being elected as Academic President by his peers. Rusty married Lynda Stevens 34 years ago. They traveled the world and supported one another in many endeavors closer to home. They also worked together at SBCC. When politics got in his blood, he decided to run for city council; together, Lynda and Rusty visited every household in the city seeking votes. He was elected three times. He was most proud of the city’s acquisition of the Naval Reserve Center (now the Maritime Museum), and his service in various positions on water quality boards. His special relationship with Mayor Harriet Miller will always be remembered. 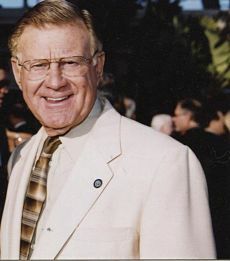 Rusty also served on several local boards including the Santa Barbara Chamber of Commerce, the Santa Barbara Scholarship Foundation, Stop AIDS Advisory, YMCA, SPARKLE, Las Positas Foundation, Lions Club, and United Way. His last years were spent at Absolute Residential Care with Slava Prykhitko as his caregiver and the owner. Memorial donations may be made to the Santa Barbara YMCA.